The concept is quite simple; a no-choice, set menu of six small dishes paired with drinks that compliment each of the dishes. The menu changes slightly every week meaning that there's always something new to try if you fancy heading back. Cub are big on sustainability too. In fact, it runs through the entire ethos of the restaurant. The ingredients throughout the menu are sustainable, locally sourced and a lot of the menu uses would-be waste items and ingredients that are often underused. 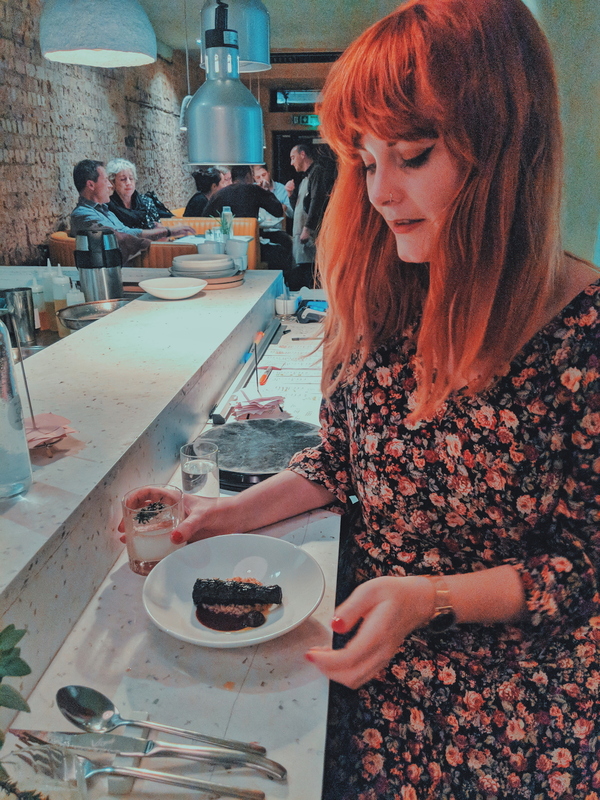 Whilst Cub is technically a vegetarian nor a vegan restaurant, the menu is pretty much plant-based with the occasional animal byproduct here and there. 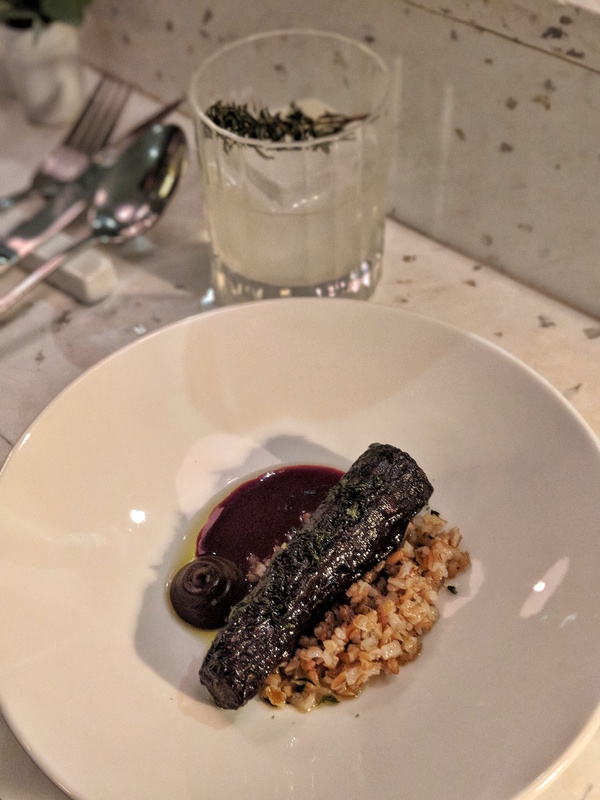 However, they're incredibly vegan-friendly and can adapt any of their non-VF dishes to make them entirely plant-based, which is what they did for our visit. 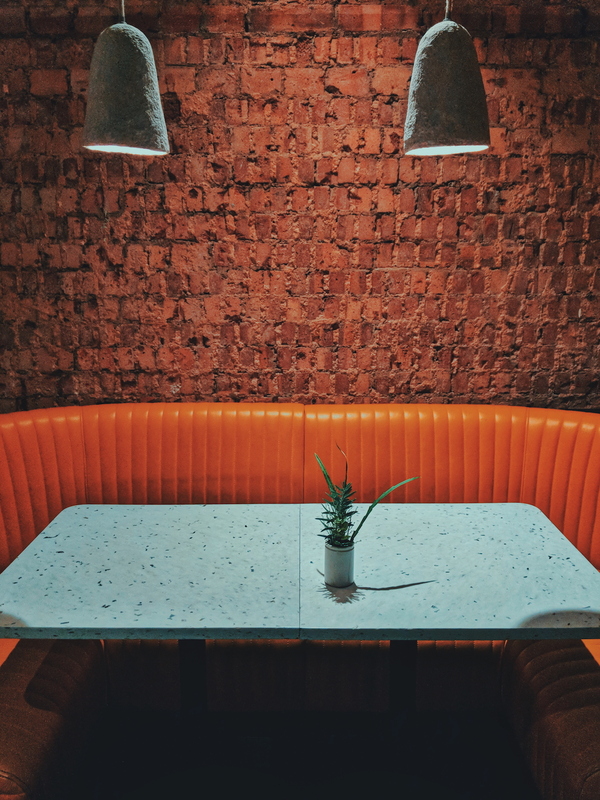 Upon entering, you're greeted by a lengthy bar and open kitchen on the left-hand side of the restaurant, a number of mustard, retro-inspired, faux-leather booths and an eclectic, lively soundtrack that sets the ambience of the restaurant. The bar is split in half with one side dedicated to drinks and the other a kitchen space for food preparation with sparkling silver kitchen utensils displayed upon a magnetic wall. 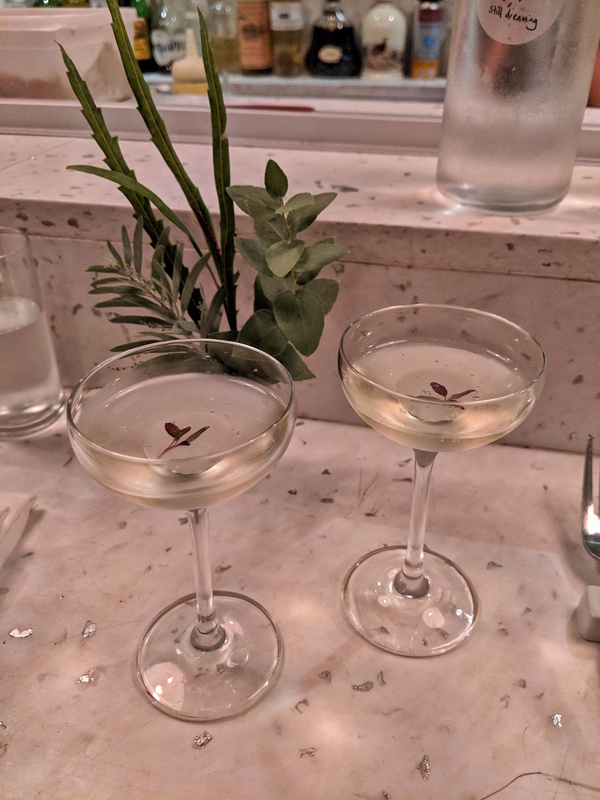 We were seated along the bar and had front row seats of the open kitchen where we could eye up the chefs delicately tinkering with the dishes and the cocktail expert continuously creating a stream of never-ending drinks. Whilst we did have a front row view of the kitchen's display, it was admittedly a little cramped and we found ourselves longing for one of the booths after being perched on a stall for over two hours, so definitely try to nab yourself a booth when you do visit! 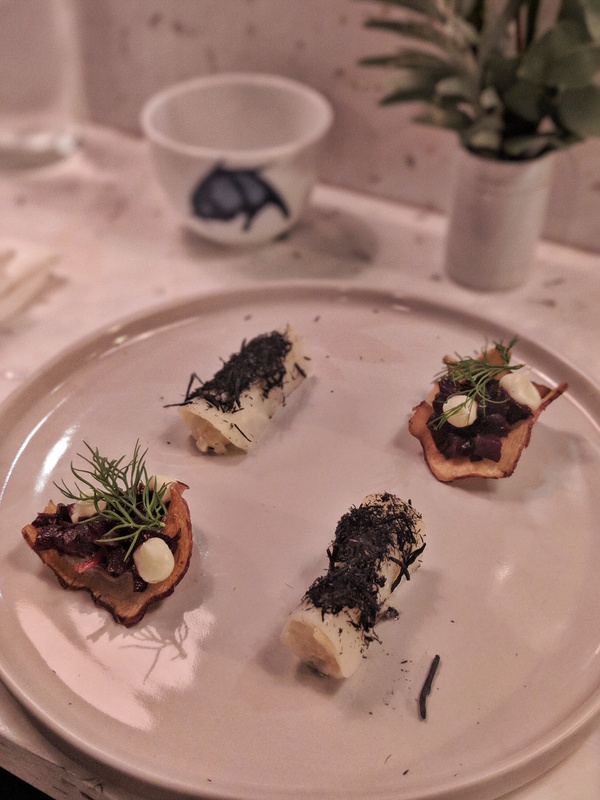 After enjoying a small green tea, our first dish was composed of two bitesize "snacks" that included pickled beetroot & horseradish upon a roasted crispy artichoke and celeriac with sea truffle topped with burnt hay. Considering this was our first taste of what was to come, there was a great deal of anticipation and expectation. We began with the smokey topped artichoke and BOY, OH BOY, it was sensational. Although it was over in only a bite, we both couldn't contain our glee and hunger for more. Our first drink of the evening to accompany our starting dish was a Krug Grande Cuvée champagne with a water jelly at the bottom of the glass that bursts with a sharp flavour as soon as you bite into it and totally transforms the flavour of the champagne. 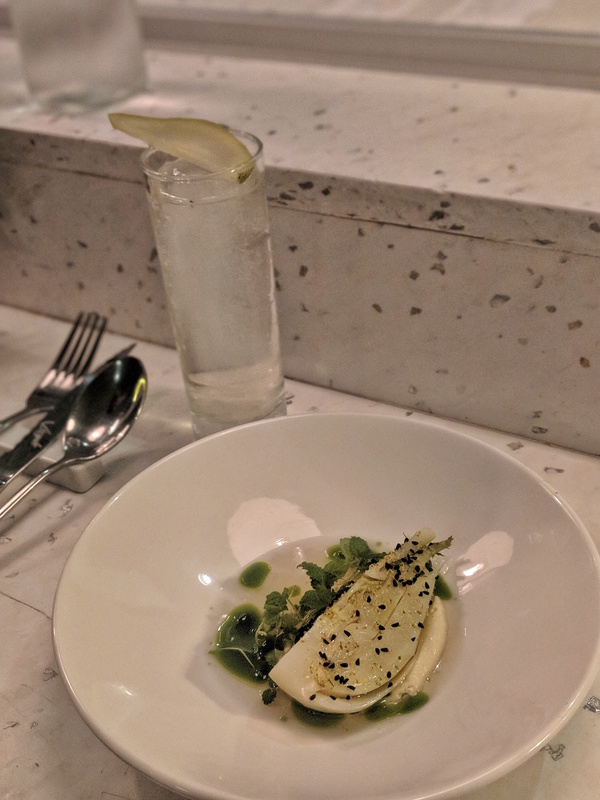 Our next plate was a brined fennel flavoured with crab apple and green juniper paired with a pineapple weed, conference pear and dandelion Beledevere vodka concoction. Now, I can't say that I've ever eaten actual fennel before nor is it an ingredient I'd consider outside of a herbal teabag. However, I was pleasantly surprised how much I enjoyed this dish. Whilst it wasn't my favourite out of the bunch, I still enjoyed it and finished it rather easily. The cocktail it was teamed with though was utterly delectable and I could have easily sipped upon an endless stream of them all evening! 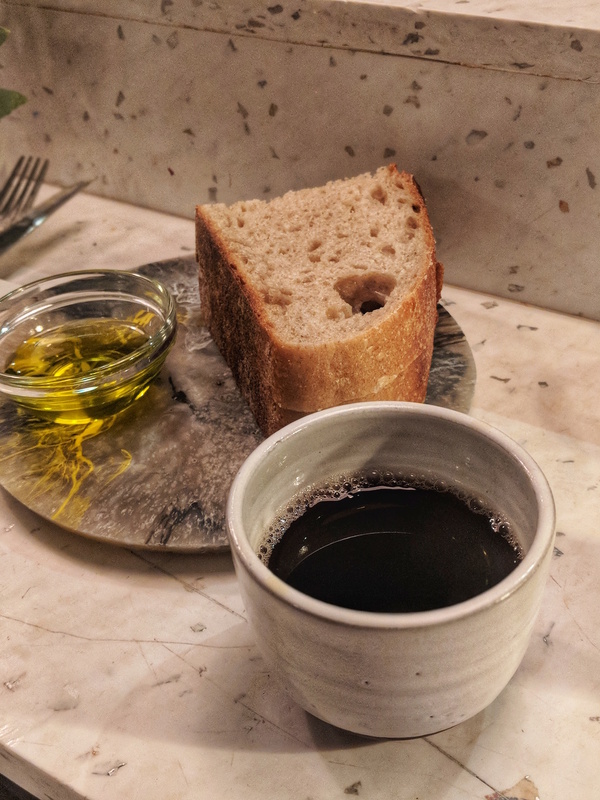 Next up was a "fungus" broth created from porcini mushrooms and sea kelp and served with a generous portion of fresh bread from local bakery, E5 Bakehouse. The broth was warming, earthy and incredibly bold in flavour. I love the taste of mushrooms so I thoroughly enjoyed it, however James isn't a fan of mushrooms at all and found it a little more difficult to ingest as the broth was incredibly rich. The soft fresh bread did however help break up the powerful flavours of the broth. One of my favourite dishes of the evening had to be the roasted salsify with leek treacle and pickled elder. 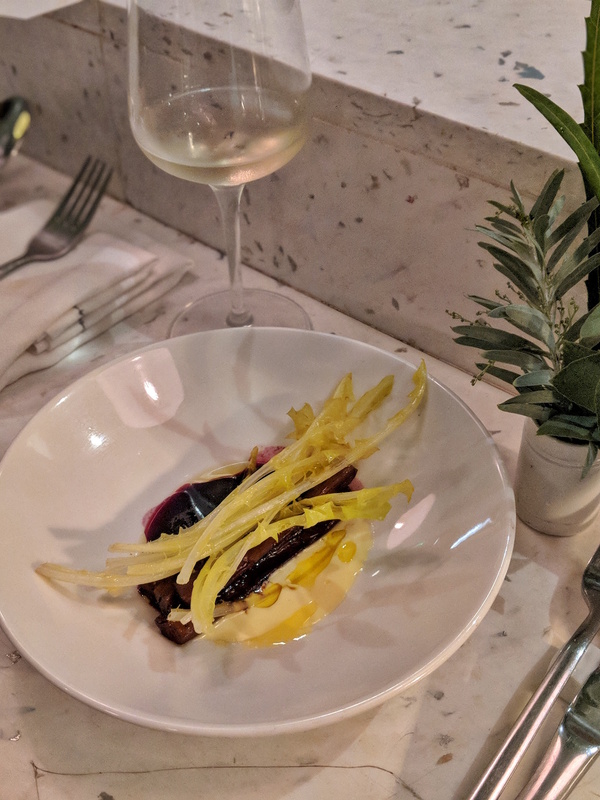 Salsify is a typically underused ingredient, although it's starting to make a few appearances in supermarkets and dishes across the country, and I had never tried it before - in fact, I didn't have a clue what a salsify even was before our evening at Cub! For those, who like me, do not know what a salsify is, it's actually a root vegetable that belongs to the dandelion family and looks a little similar to a parsnip or carrot. The creamy consistency of the leek treacle, the sweetness of the elder and the sharpness of the dandelion leaves all within one dish was an explosion on the tastebuds and I honestly couldn't get enough of this dish. It's safe to say, my first experience with salsify was pretty successful! My favourite dish of the entire evening was definitely not the most picturesque but this fermented, roasted and blackened carrot on top of a bed of fava bean miso and sprinkled with 'winter savoury', a mixture of complimentary herbs and a helping a pickled elder once more as a replacement for the "ewe's curd" that is usually on the menu. This dish was so hearty, wholesome, bursting with flavour and contrasting textures. Quite frankly, I could happily eat this dish every day. Our final dish was something sweet to round up the evening. 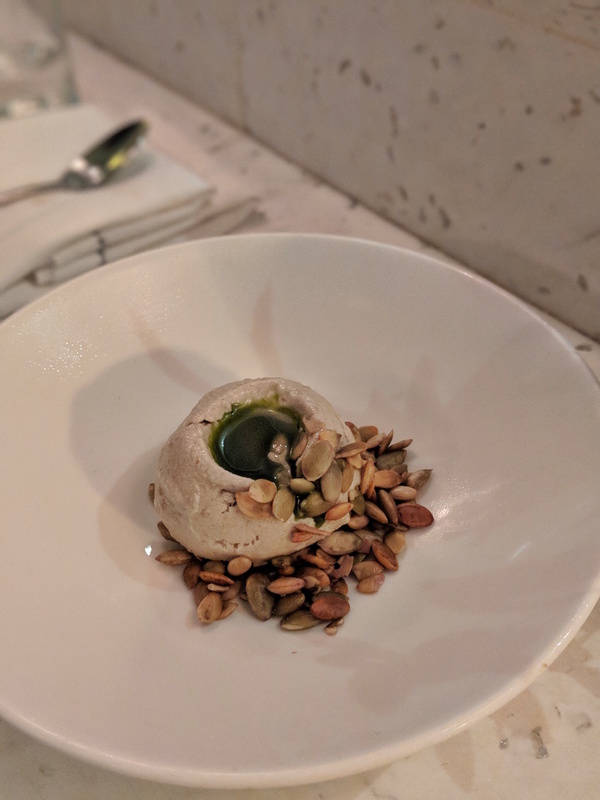 Presented to us was a pumpkin seed ice cream made purely from milking pumpkin seeds, topped with a splash of liquified Douglas Fir and sprinkled with whole pumpkin seeds. As we were eating the vegan designated options, ours came without the white caramel sauce as listed on the menu. In all honesty, the ice cream was unlike anything I'd ever tasted but it was far too rich and definitely needed something sweet to break up the overpowering taste of the pumpkin seeds. It was teamed with a deliciously sweet lemon cocktail that was a concoction of Amalfi lemon, lemon leaf and lemon balm and was reminiscent of a limoncello! Disclaimer: We were invited for a complimentary meal at Cub in exchange for an honest review. All words are my own. What an amazing experience, I would love to try this place out!